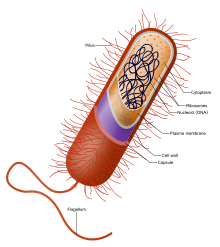 ↑ "Bacteria (eubacteria)". Taxonomy Browser. http://www.ncbi.nlm.nih.gov/Taxonomy/Browser/wwwtax.cgi?mode=Undef&id=2&lvl=3&lin=f&keep=1&srchmode=1&unlock। আহৰণ কৰা হৈছে: 2008-09-10. ↑ Stewart EJ, Madden R, Paul G, Taddei F (2005). "Aging and death in an organism that reproduces by morphologically symmetric division". PLoS Biol. খণ্ড 3 (2): e45. doi:10.1371/journal.pbio.0030045. PMID 15685293. ↑ Fisher, Bruce; Harvey, Richard P.; Champe, Pamela C. (2007). Lippincott's Illustrated Reviews: Microbiology (Lippincott's Illustrated Reviews Series). প্ৰকাশক Hagerstwon, MD: Lippincott Williams & Wilkins. পৃষ্ঠা. Chapter 33, pages 367–392. ISBN 0-7817-8215-5.